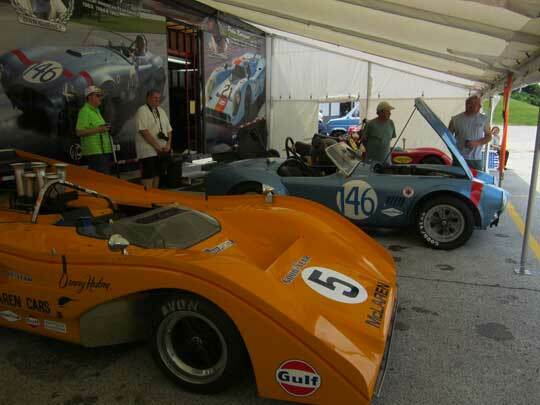 On Friday, July 18th I met a friend of mine at about 5:15 in the morning on a highway exit to meet up and drive to Elkhart Lake, Wisconsin, the home of Road America, and this particular weekend, the HAWK Vintage Races with Brian Redman. 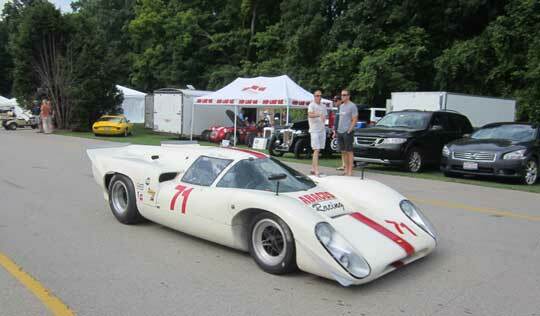 See photos below, or more than 100+ photos in this album on my Flickr page. 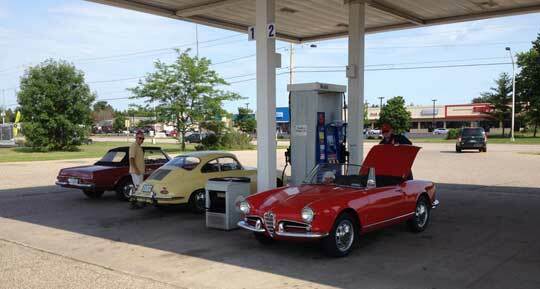 Gas stop somewhere in Wisconsin. 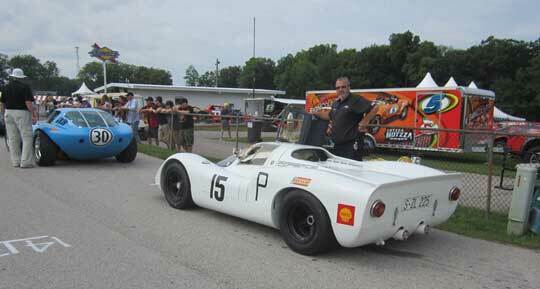 Mark passes me in the 356. 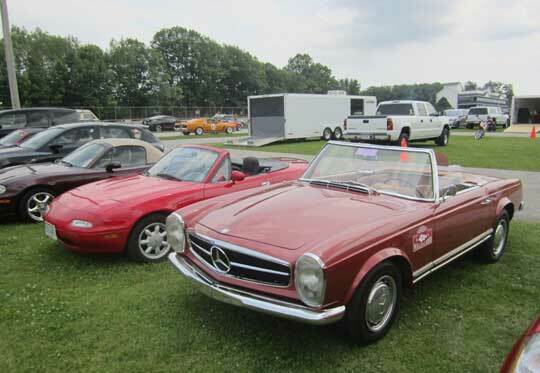 As I pulled into the parking lot we had decided to meet at, I saw my friend Kevin’s 1960 Alfa Romeo Giulietta Spider (top down) coming down the off ramp to collect me in my 1966 Mercedes 230SL. 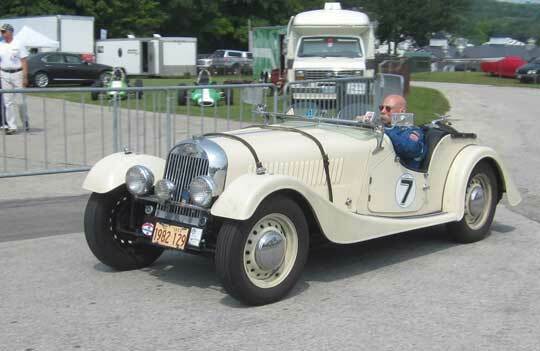 He drove in, circled around me and with a wave of his string backed driver’s gloves, off we went with a simple yelling of ‘let’s go’ over the sounds of our revving engines. 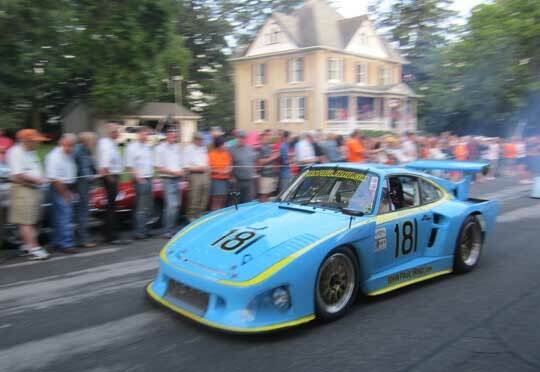 Ex-John Paul Jr. Porsche 935 squeals away in downtown Elkhart Lake Friday night. We wanted to beat any rush hour traffic that might come along on a Friday morning, it was still dark outside, I knew we’d miss all the poor slobs driving into work, it was so early. Our plan was to take Kevin’s regular route east out of the Twin Cities and then southeast into Wisconsin where we would pick up the last man in our classic car convoy and take back roads for about 7 hours to Elkhart Lake, arriving in time for the Friday night race car Concours d’Elegance on the streets of downtown Elkhart Lake. 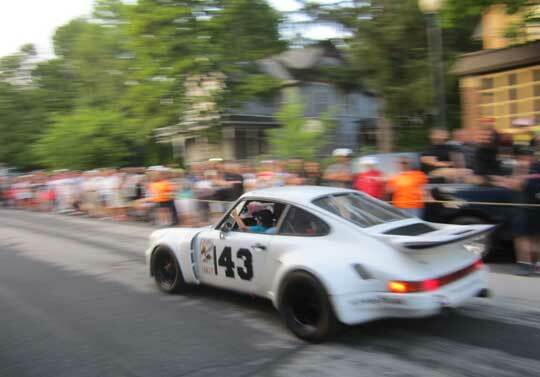 They actually drive the race cars the three or four miles from the track, on public roads, into Elkhart Lake where, basically, a big street party ensues until dusk when the cars (many without headlights) roar back to the track to the delight of the onlookers lining the streets. 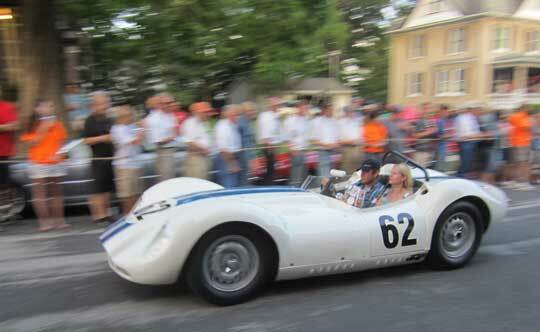 Colin Comer in his Lister Knobbly. 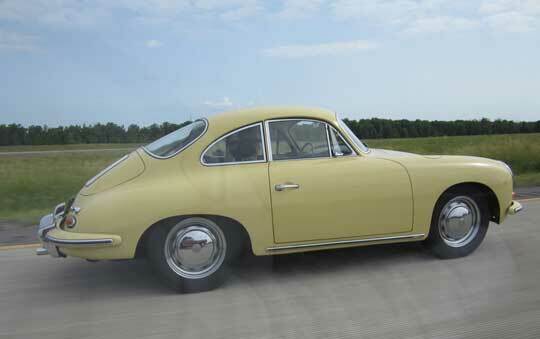 About an hour into our drive we crossed over the Mississippi River into Wisconsin where we picked up the third participant in our convoy… my buddy Mark in his Champagne Yellow 1965 Porsche 356. We stopped at a gas station briefly where Mark passed out our newly acquired Cobra ‘Walkie Talkies’ so we could make ridiculous small talk while weaving our best ‘Dukes of Hazzard’ CB lingo into the conversation… they proved to be a lot of fun. 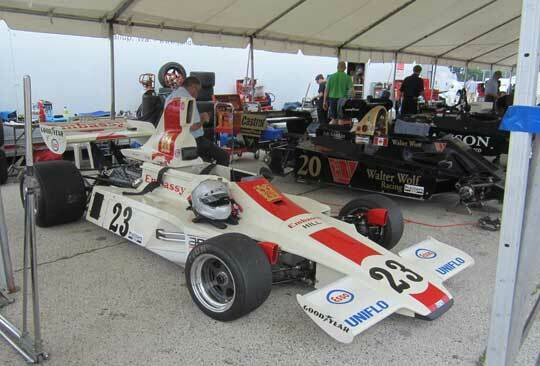 The 230 parked in the paddock (false grid in background). 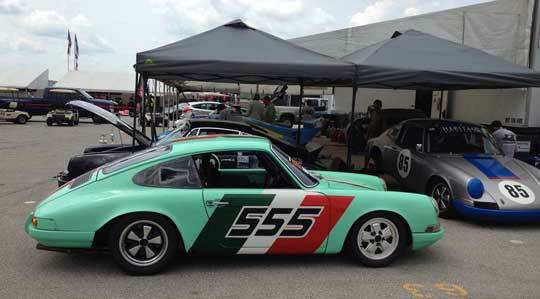 I was scheduled to work, as usual, as an SCCA worker this weekend, on the false grid, lining cars up for the next practice session or actually gridding cars in their numbered grid positions based on qualifying times, I’ve been doing that with the SCCA for about 15 years now I guess. 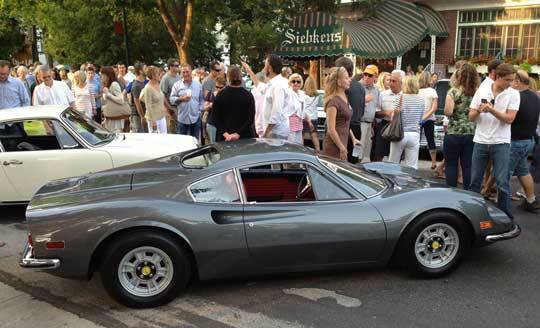 Pretty 246 Dino in front of Siebkens Saturday night. 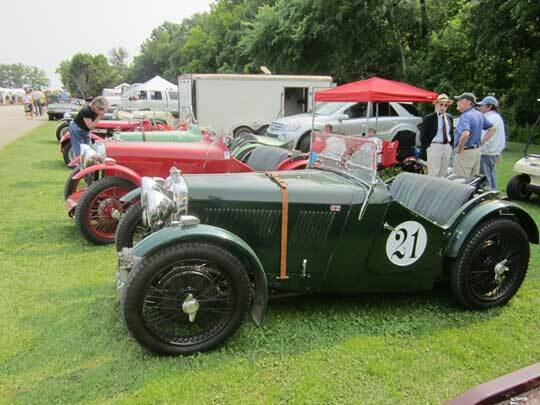 It was, as usual, an insanely cool weekend of great cars from all over the country, from pre war cars to ALMS cars that were racing competitively just a few years ago, and everything in between. 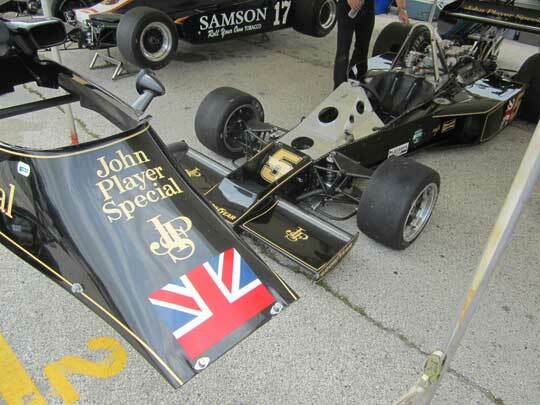 And, of course, the cars parked at the track and in downtown Elkhart Lake (especially Saturday night for the Street Car Concours) were just as cool as what was on the track all weekend. 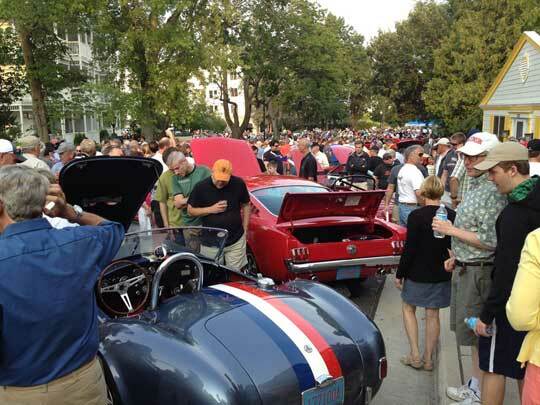 This event is like the Monterey Historics in the mid-west, many of the same cars, owners and drivers come to this event, it’s absolutely a blast and you should put it on your calendar and attend at least once in your life. 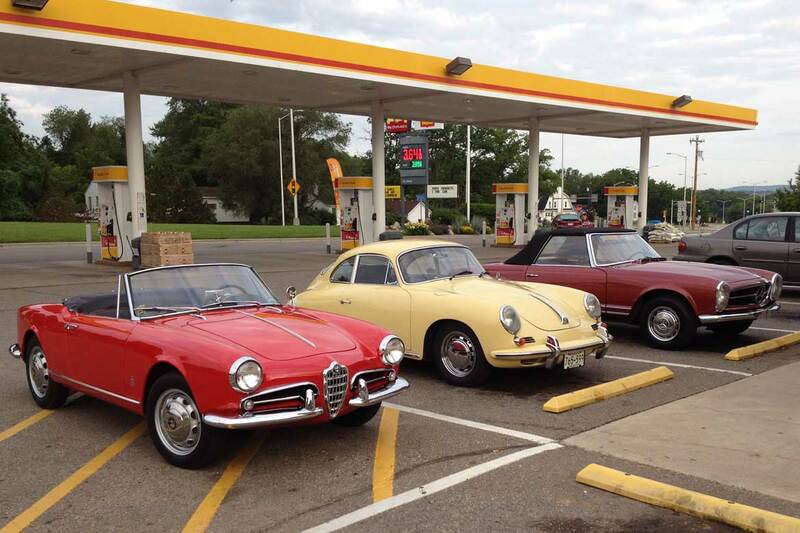 Kevin and I drove back Sunday, Mark came back Monday… none of us had a single mechanical problem, our (almost) 50 – 50+ year old cars performed flawlessly on the long drive to and from Elkhart Lake. 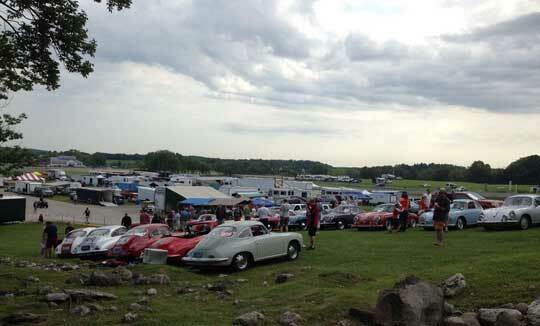 On the back roads, in those old cars… a few times, I could have sworn it was the mid 60s. 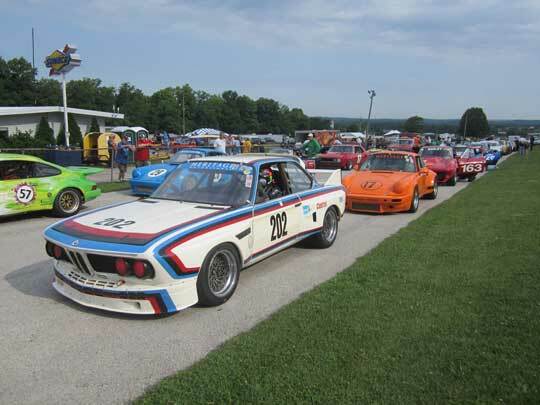 These cars really can be like time machines, not that I much new what the 60s felt like… while the other guys I was with sure remember them… I wouldn’t be born for another decade. 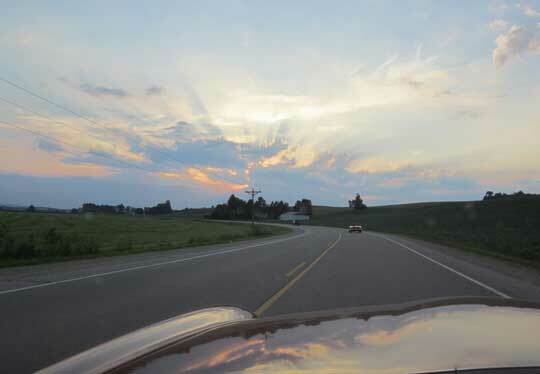 Driving home Sunday night as the sun sets in the West. 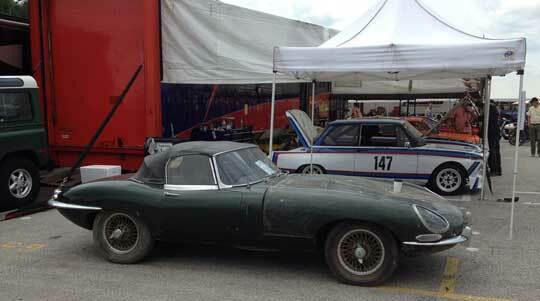 Barn find Jag in the paddock. 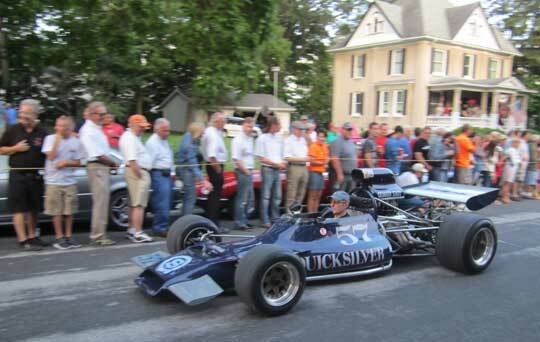 Street car concours, downtown Saturday night. 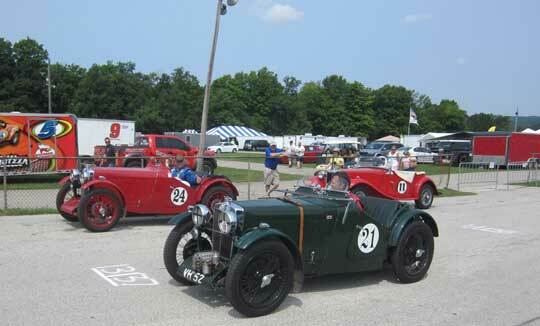 Flat radiator Morgan pulls onto the grid. 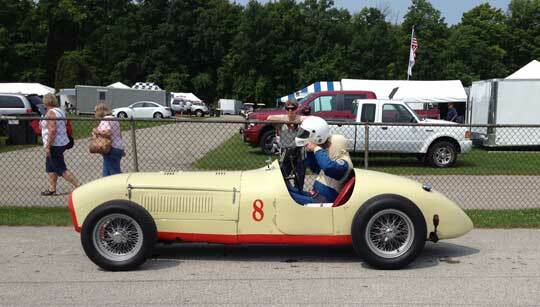 Marv Primack in his ’47 Lester MG.